This excellent venison jerky recipe is an easy way to turn your deer meat into something tasty and fun to eat. I've used this recipe for years, and everyone I've shared it with really likes it a lot. This jerky recipe works well with beef and with wild goose meat, too. To get the venison ready for the marinade, trim off any fat, sinews, and silver skin. Rinse off any remaining hairs and dirt that may be adhering to the meat. Mix together one half cup each of water and soy sauce. To this, add one tablespoon of Morton's® Tender-Quick®. (This is a curing mixture that will inhibit bacteria growth.) Next, add one-quarter cup of brown sugar, one and one-half teaspoons of Cajun spice mix, one tablespoon of black pepper, one teaspoon of cayenne pepper, one tablespoon of garlic powder, and one teaspoon of celery salt. Mix thoroughly, making sure that the sugar and Tender-Quick® is dissolved. This venison jerky recipe, or for that matter, any kind of jerky needs to be smoked or dried at a low temperature. If possible, keep your smoker temperature between 160 to 200 degrees Fahrenheit. The thin pieces of meat will absorb smoke easily, so be careful not to over smoke. It will take from two to six hours, and maybe more, for the venison jerky to finish. It should be fairly dry, but still pliable. It will have shrunk up by about one-third its original size. When you remove the jerky from the smoker, it's best to put it into a sealed container or plastic bag for at least one day. The flavor of the smoke will even up, soaking deeper into the meat. If you don't have a smoker, or would rather dry the jerky inside, you can use a food dehydrator or your oven. 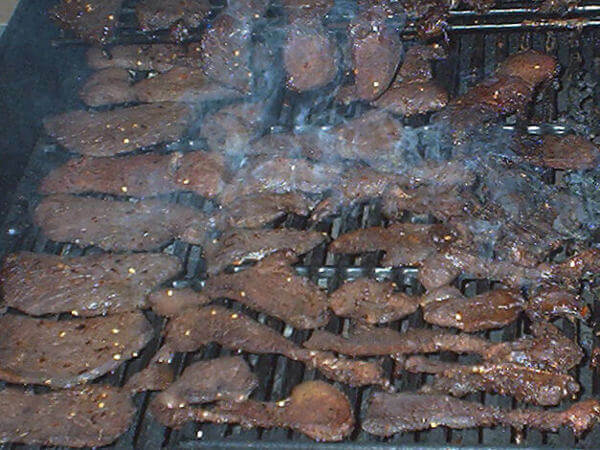 To give a smoky flavor to the jerky, add two tablespoons of Liquid Smoke to the venison jerky marinade. To oven-dry jerky, stick a toothpick though one end of the strip of meat and hang it through the upper oven rack. Place a pan or foil on the lower rack to catch the drips. Set the oven temp to 170F and leave the oven door cracked open a couple of inches. This jerky recipe is a great way to turn some of your venison into a handy snack, and as I said before, it works equally well with beef and goose. It usually doesn't last too long, so make plenty!